We may have lost are minds but we keep making episodes? We’ve re-branded folks! This week after Trump stunned the world we have decided to mark the occasion by re-branding the show… hence the A.T. moniker (after Trump) to mark the beginning of the end of days. And so to further celebrate the oncoming apocalypse we have invited the patron saint of race relations T-Shirt Joe back onto the show and he is bringing a post-apocalyptic flick called DEATH RUN with him. 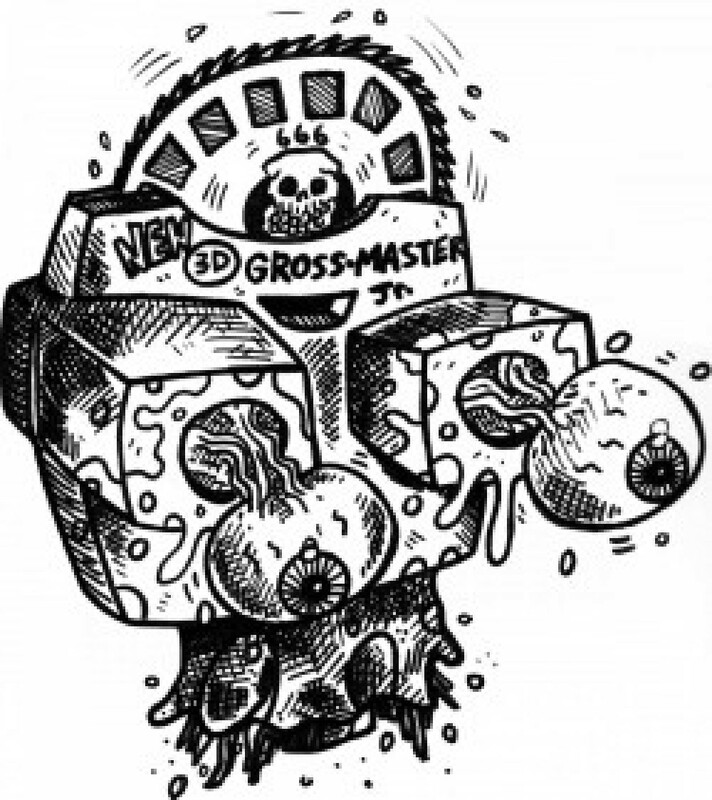 Tim is also talking about the best slasher featuring a former president in THE TRIPPER, and Kyle is covering the weirdest, sickest, oddest flick to have dropped in 2016 in THE GREASY STRANGLER. All this and News, topical discussions, and disco dancing’ so listen up. Big Ronnie would want you to. Episode 203 is roundtable time! We had so much drunk fun the first time that we all got together and did it again. The round table is back! We invited T-Shirt Joe and Rodrigo Quast back too. We talk about everything genre related, the life and times of “Ragtime” Billy Peaches, Books, and a ton of other stuff… but mostly ranch dressing. Don’t know what episode it is but we are having fun doing them! This week we return to talk about another 3 movies. First Tim covers WHITE PHANTOM: ENEMY OF THE DARKNESS. A movie Kyle found that features Bo Svenson as a ninja. Next we talk about THE ASPHYX. A movie that may or may not been ripped off to make Ghostbusters. Next T-Shirt Joe talks about THE WITCH. Also we recap our adventure to HORROR REALM in Pittsburgh. One reason you should come to Horror Realm…? The celebrity list looks great, events look fun, awesome vendors as usual, plus Tim Gross will be there with Out of Print Dan selling the new book “Gross Movie Reviews: The Wrath of Gross” , copies of Jagoff Massacre, and some other cool goodies from OOPD! But what if you had to pick one thing or reason you should come to Horror Realm because there is nothing like it around the state of Pa? For me it would be the man, the myth, the Frito-Pie eating, the T-shirt making machine, the legend… Joe Garcia!!! New show is up and we have special guest T-shirt Joe! I haven’t watched one second of Game of Thrones so Kyle and T-shirt Joe team up for a special podcast! Kyle and fellow Game of Thrones fan T-Shirt Joe got together to record this one off episode. And as 2 guys who have never read the books we won’t spoil anything for you. We discuss our favorite people on the show, memorable episodes, and try to predict what will happen in the future. Also be sure to count the time we say “oh yeah, that dude. Or, “you remember, that one guy”. There will be a test later. And remember in the game of podcasts, you either win…… or you die. So enjoy. Episode 120 we invite T-shirt Joe back so we can be all over the map of filmland! This week T-Shirt Joe comes back to the show to tell us about Racism on Star Trek. Along the way we talk about how Richard Pryor should have killed superman. Zombie STD’s, How awesome Hannibal the T.V. series has been, Juggalo’s being sighted in Kyle’s neighborhood, John Carpenter’s appearance on the El Ray network, Liam Neeson: THROATPUNCHER! We also got Arthurian Knights in EXCALIBUR. Robot teachers in CLASS OF 1999 and Class of 1999 part 2: the substitute. And a northwestern Amish like slasher in AMERICAN GOTHIC. So download and enjoy, or Rod Steiger might sell his soul to SATAN!!! Episode 99 is up folks! This week Tim and Kyle are joined once again by our own leader of race relations, and lover of beer T-Shirt Joe. This week it’s our annual end of the year best of round-up of literature and most of all movies. I know it’s a week behind, but you can blame that on the bronchitis. Also on this episode we go through what we’ve been watching over the last week. And 101 uses for government cheese. So check it out. Kristy Swanson would want you to.